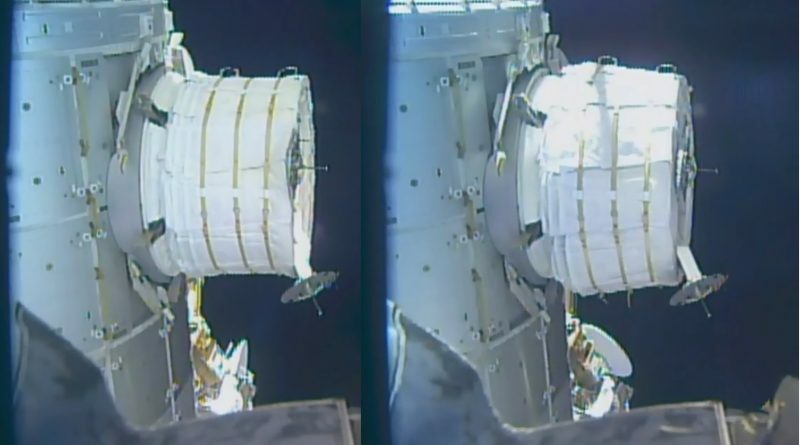 BEAM was depressurized on Friday to allow the outer fabric material to relax before the crew will come back on Saturday to again introduce air into the module and attempt to expand the structure. A two-hour deployment attempt on Thursday resulted in the expandable module only growing by a few centimeters in length and showing some bulging around its circumference when a full deployment from a 1.7 by 2.4-meter envelope to 4.0 by 3.2 meters was the expected result. BEAM, the Bigelow Expandable Activity Module, is the fist of its kind flying to the Space Station and is set for a two-year test mission of expandable habitation module technology in a human environment where it is expected to be put to use in the future. 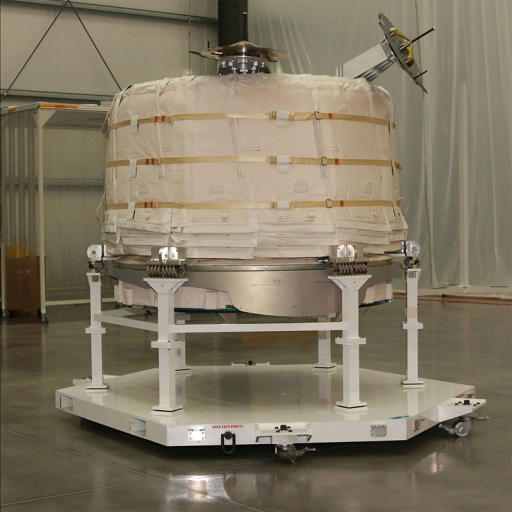 The module’s expansion, a five-step process, worked swimmingly starting with the first preparatory steps executed earlier in the week until the actual release of air into the module. Pyrotechnics were fired to cut straps that held BEAM in a packed configuration since launch, bolts were released to free up the module’s forward bulkhead to move away from the aft side of BEAM when expanding, and a vent valve was closed after keeping BEAM at vacuum for launch and installation. 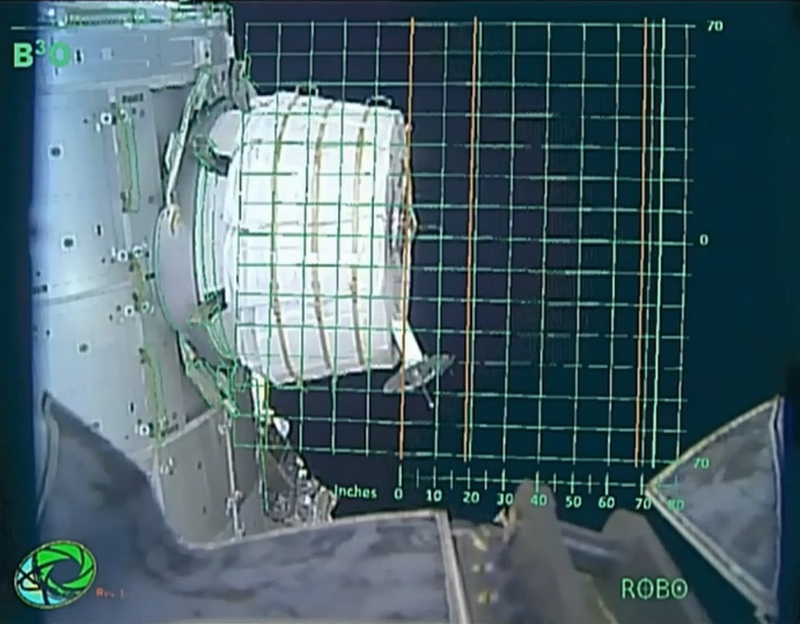 Deployment was to be completed by Astronaut Jeff Williams by manually manipulating the Pressure Equalization Valve between the Node 3 module and BEAM to introduce a carefully controlled volume of air into the module. Pressure was seen rising and BEAM showed axial and circumferential movement as had been expected by engineers. However, after the initial motion, progress stopped even though additional air was added to the module. The original BEAM design called for the module carrying its own pressurization bottles, but analysis showed that expansion could occur rapidly when using this system and overstress systems of ISS. As a workaround, plans were developed for the expansion of the module by a controlled transfer of air from the Station through the Manual Pressure Equalization Valve on the CBM hatch of the module. Pressurization of the interior of BEAM to normal atmospheric pressure on ISS will still occur from the internal pressure bottles after BEAM has taken shape. With deployment stalling despite BEAM being at a higher pressure than expected, Mission Control decided to play it safe and abandon operations on Thursday. BEAM was left in a pressurized state and a very slow progression of deployment could be seen overnight with the module growing in length and increasing in diameter – giving merit to the scenario of BEAM’s polymer material showing some stiction after being in a packed state for an extended period of time. Prior to BEAM’s launch aboard the SpX-8 Dragon, Robert Bigelow noted that Bigelow engineers were not fully sure how the module would perform in space after being bound up for over one year awaiting its launch that had suffered a lengthy delay after the Dragon SpX-7 launch failure. According to NASA, friction forces between the outer fabric are the leading suspect for BEAM’s struggles. These forces could be easily overcome by a more aggressive pressurization of BEAM, however, the primary driver for the slow approach that was chosen for expansion are loads imparted on ISS with the overall goal of minimizing any stress on the Station’s structure. The Genesis free-flyer modules flown by Bigelow in 2006 and ’07 were not limited in deployment speed and therefore did not have similar issues. Bigelow and NASA decided on Friday to have the crew open up the Ascent Vent Valve again and depressurize the module and allow the fabric to relax and re-position – possibly reducing some of the friction forces and increasing the likelihood of success of a second pressurization. 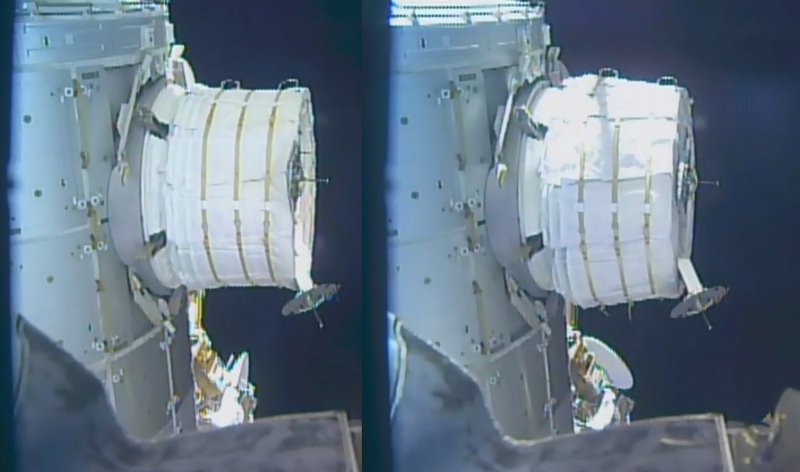 Jeff Williams will be back in Node 3 on Saturday to re-attempt the expansion of BEAM. NASA and Bigelow were still evaluating whether the procedure will again use a series of small bursts of air allowed into the module or a longer airflow to get deployment started. Both NASA and Bigelow stressed that the result of Thursday’s troubled expansion was not fully unexpected as the technology is still in an early stage without much previous flight experience. Data gathered on Thursday and the next attempt is considered extremely valuable for improvements on future expandable modules set to fly for commercial and government customers. Should Saturday’s deployment result in a fully expanded module, final pressurization will occur shortly thereafter followed by hatch opening and crew ingress about a week later for the installation of instrumentation to record BEAM’s behavior over its two-year mission. If BEAM’s deployment again ends short of the set expansion goal, teams will depressurize the structure and line up a new attempt, most likely towards the end of next week constrained by the schedule of operations aboard ISS. The benefit of expandable structures is their compact size and low mass when being launched into space before deploying and providing abundant living and working volume for crews, either on an orbital mission or for long-distance space travel. Looking at a much lower launch cost than rigid spacecraft modules like those used by ISS and previous Space Stations, expandable habitats are of interest to government as well as commercial users. First studies of expandable module technology began shortly after the dawn of the space age and NASA planned at one point to deliver a large expandable habitation module to the International Space Station. These plans were ultimately scrapped and the technology was licensed to the private sector. 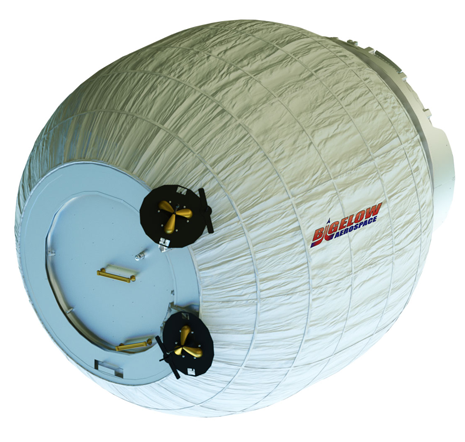 Bigelow Aerospace picked up where NASA left off and finalized the design of multi-layer expandable modules for a variety of applications in space. 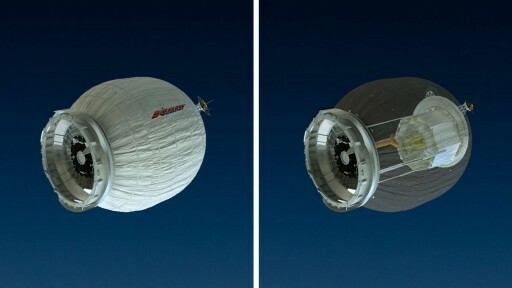 Two Genesis pathfinder modules demonstrated the technology in space, showing that the modules can stay intact and hold pressure for long periods without issue, also providing adequate protection from radiation and temperature changes. 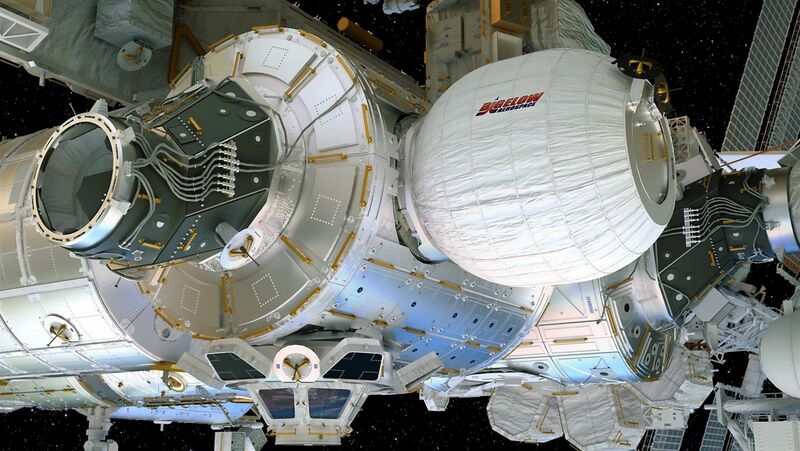 NASA and Bigelow partnered up in 2012 when the contract for the BEAM mission was signed, calling for a two-year durability test of an expandable module at the International Space Station. BEAM was initially looking forward to launch in 2015 on the Dragon SpX-8 mission, but had to wait nearly a year due to a stand-down of Falcon 9 launches after the Dragon SpX-7 failure. 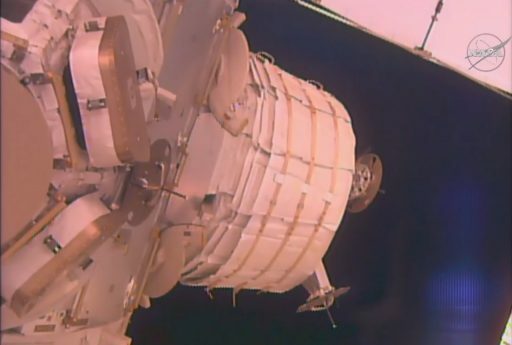 Finally arriving on ISS in April, BEAM was installed on the aft port of the Node 3 module by the Station’s robotic arm and sat dormant for over a month ahead of Thursday’s deployment attempt. There were four different models of how BEAM would actually expand and teams were eager to verify which of those would be accurate for use in future module developments that will be much larger than BEAM. Running into some teething problems during deployment will yield plenty of data for future developments in terms of material properties as well as deployment procedures – once again highlighting the Space Station’s role as a testbed for future space technologies.